HD sculpting is an extension of subdivision sculpting. Using HD sculpting, you first do regular subdivisions of the model you are working with, up to a level your system can comfortably handle. If you need further subdivision levels beyond that, you can perform HD subdivisions (as discussed below). These add polygons to your model exactly as for normal subdivision, but keep the portion of the model that is being worked with at any time to a size that leaves your system reponsive. The HD Geometry controls are in the Tool > Geometry HD sub-palette. 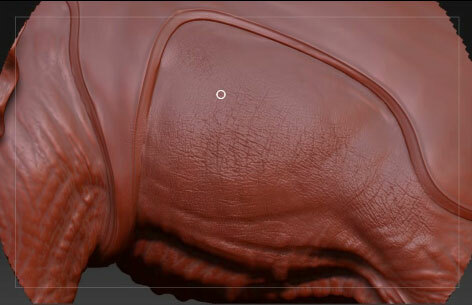 To show how to work with HD Geometry we’ll look at sculpting an elephant’s skin in extremely high detail. Much higher than has been previously possible without a complex workflow. 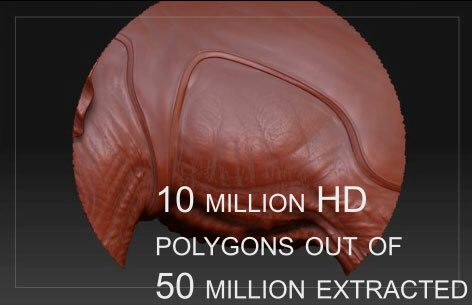 In fact, with HD Geometry you can keep your mesh one solid piece and sculpt up to 1 billion polygons. 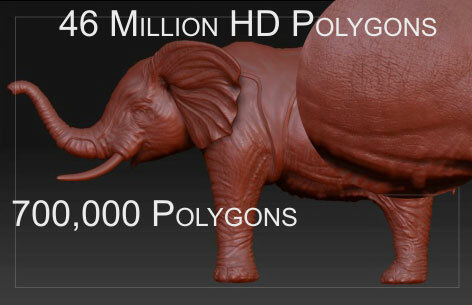 In this example, our elephant is subdivided to about 700,000 polygons. We press, Tool > Geometry HD > DivideHD three times until it’s divided to 44 million polygons. Then, hover our mouse over the area we want to sculpt and press the a key. A circular area around our model has been selected. The selected area of the model comprises about 10,000,000 polygons — the number is determined by MaxPolyPerMesh. Sculpt this section of the mesh as normal. 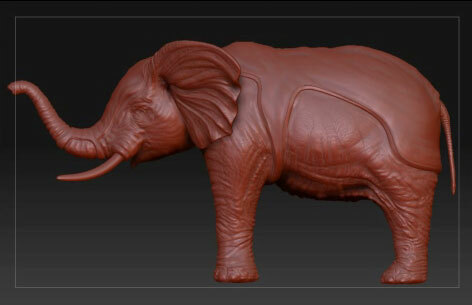 Here is some quick sculpting on the 10 million polygon side of the elephant. This level of detail would be extremely hard to obtain using bump maps and normal geometry. When we are done, press the a key again to exit Sculpt HD mode. The entire model is again displayed with the approximately 700,000 polygons we originally subdivided it to. 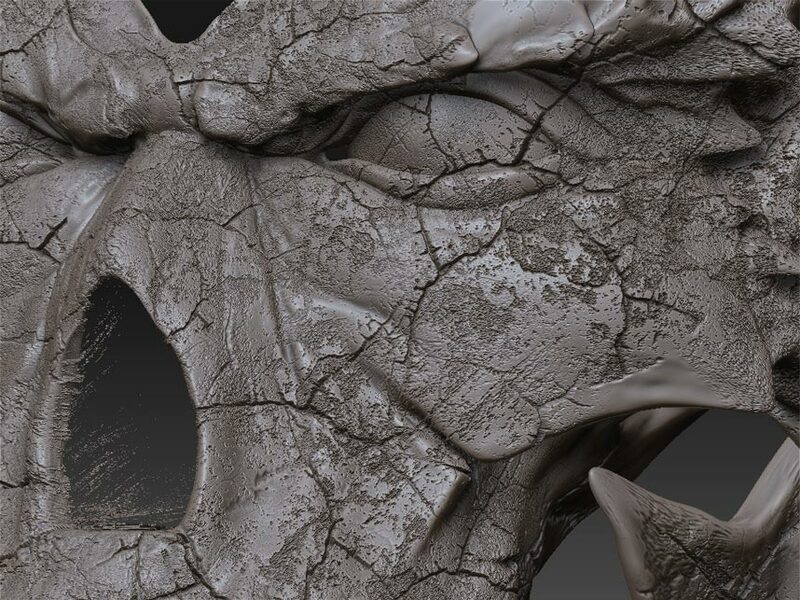 However, the high-definition sculpt we just did is retained and will appear again when we re-enter Sculpt HD mode. To render your HD Geometry press the Sculpt HD button or press the A key while the cursor is positioned away from the model. If your render shows ‘holes’ in the model turn on the Tool > Display Properties > Double button and render again. To render HD Geometry using BPR turn on the HDGeometry switch in the Render > Render Properties sub-palette. Rendering with BPR will render HD Geometry for all SubTools.